By consistently staying ahead of the development taking place in international civil aviation, CINEC Campus has attained the position of a catalyst for the industry by being able to develop new programs that are not readily available elsewhere in the country. CINEC has been conducting the Aircraft Maintenance Engineering training program under the License category B1.1 (Aeroplane Turbine) which is approved by the Civil Aviation Authority of Sri Lanka (CAASL) and in accordance with the European Aviation Safety Agency (EASA) part 66 syllabus. This program gives students an in-depth theoretical and practical knowledge required to become aircraft maintenance engineers. Moreover, CINEC is the only recognised international examination centre of the Civil Aviation Authority of United Kingdom (CAA-UK) for EASA part 66 licensing examination in Sri Lanka. The trainees are provided with 600 hours maintenance practice exposure on functional Learjet aircrafts and another 600 hours of training in engine shops, composite and structural workshops. Most importantly, CINEC further facilitates the trainees with a training on hydraulic simulators and Level One training on Non-Destructive Testing (NDT) beyond the curriculum requirement. The lectures are conducted by experienced lecturers who have over 35 years of industry experience as Aircraft Engineers, Managers and Airworthiness Experts. 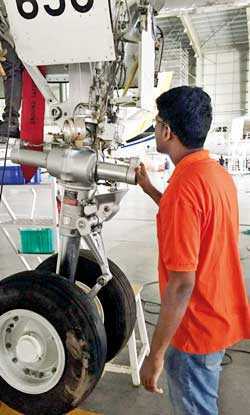 At present, CINEC is facilitating the trainees’ on-the-job training at Air Seychelles partnered with Etihad, FIJI Airways and Airworks, India’s Largest Independent MRO, for a period of two years in order to gain maintenance experience on aircraft types: Airbus A320, A320 neo, A330, Boeing 737-800, ATR and Twin otters. Applications are currently open with a limited number of 28 students for the January intake. Aspiring to be a top aviation training centre in Asia, CINEC is currently the benchmark in the country in their best practices.